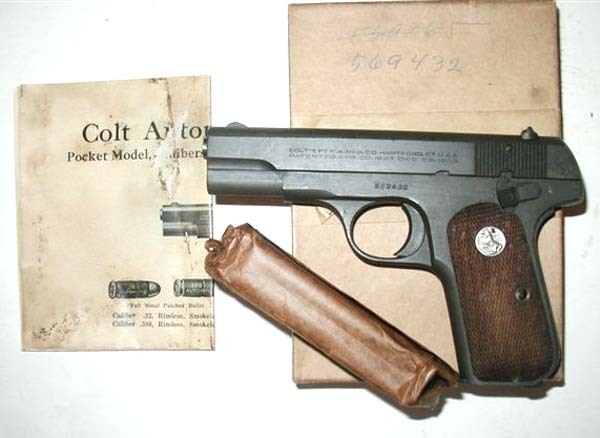 Colt Model M .32 ACP issued to Major General Edgar C. Erickson on 6/15/1959 upon his retirement. 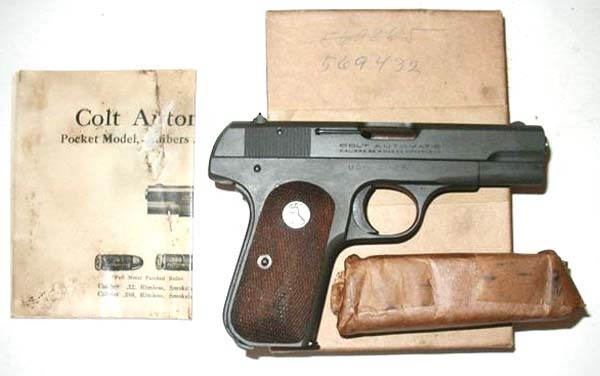 The pistol has never been fired and the magazines are still in their sealed wrapper in the box. The box has no print on it except for the handwritten serial number on the top. General Erickson was the chief of the National Guard and had his office in the Pentagon. His military career started in the early 1900's which put him in the Mexican Border Wars against Poncho Villa. He was a lieutenant with the AEF under Pershing fighting in France. He ran for and won a state senate seat from the Worcester, MA district and later became the adjutant general of the state. He took a demotion to colonel to fight in WW II. He spoke fluent Swedish and could converse in other Scandinavian languages. He joked with relatives about the Army and their infinite wisdom sending him to China to plan and execute a rear holding action against the Japanese. He said, "I never knew the Chinese could speak Swedish!" He trained troops for Chiang Kai Shek and was asked to stay on and help form an army to overthrow Mao. Instead he came home and took his post in Washington, DC under the Eisenhower administration. He had many rich and interesting stories from his many years in the service and loved this country very much. He has many citations from Chiang Kai Shek. He also has much correspondence from various U S Senators on the Armed Services Committee congratulating him on his retirement.